Saving Maryland isn’t your job or mine. It’s ours. What will it take to make Maryland the most competitive and business-friendly state in the nation? The state’s top business voice say it all starts with a united, coordinated effort from Maryland’s businesses. The state’s top fiscal watchdog says it will take a whole lot more than that. 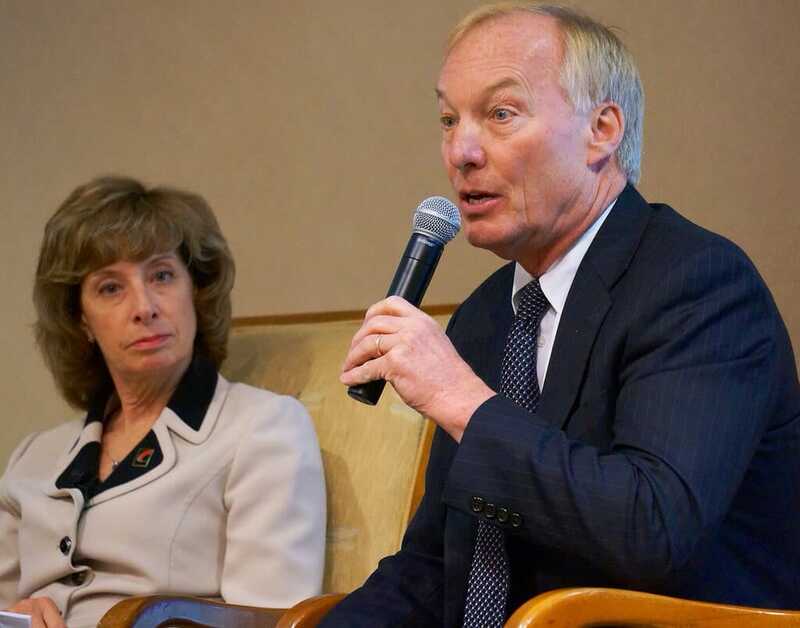 That was the point-counterpoint at play during the MACPA’s Business and Industry Conference, where Maryland Chamber of Commerce CEO Kathy Snyder and state Comptroller Peter Franchot offered their ideas for bolstering Maryland’s business and fiscal environments. When it comes to business in Maryland, Snyder and Franchot are allies who generally see eye to eye. That much was clear at the conference, where each eagerly backed the others’ ideas. Still, some differences surfaced — not of ideology, mind you, but of priorities. Snyder said Maryland businesses face some daunting challenges. When viewed through the lens of a financial report, she said the state’s finances are “scary” and “eye-opening.” Maryland’s reliance on federal funding is a nightmare waiting to happen. And advances in technology may render many local jobs obsolete within the next decade. The state is trying to convince the FBI to relocate its headquarters — and thousands of new jobs — to Maryland. With IT security dominating national headlines, Maryland is home to some groundbreaking cyber security entrepreneurs. The state’s business incubator system is second to none. The challenge, Snyder said, is keeping those young businesses here once they leave the incubators. “We need the business community to unite and say, ‘Maryland is a great place to do business,’” Snyder said. The Coalition is a first step toward that end. The state’s investments going forward must be “thoughtful and sustainable,” he said. Basic financial literacy should be a prerequisite for high school graduation, Franchot said. “After that, I would make every state legislator pass it, too,” he said, joking only slightly. Given the hyper-sensitive nature of politics today, Franchot said Maryland needs financial experts like CPAs to throw their hats into the political arena. Educating legislators about the financial consequences of their actions and funding thoughtful, fiscally sound lobbying efforts are but two of the ways in which CPAs can make their voices heard. “If Maryland’s CPA’s become politically active, they can have a huge impact on the state’s fiscal responsibility,” Franchot said. “It’s time to stop thinking of political activism as talking to politicians and start looking at it as a business proposition,” she said. Here’s the point: No one group holds the key to Maryland’s competitiveness. We all do. We need the ideology of the business community, the activism of individuals, the expertise of CPAs, and their willingness to teach lawmakers. It takes a village to save our state. Will you do your part? While you’re thinking, find out more about the Maryland Competitiveness Coalition here. Attend CPA Day in Annapolis on Jan. 29, 2015. You’ll get to talk about the issues directly with your legislators and earn two free hours of CPE at the same time. Donate to our PAC. Contributions help us support legislators who support the profession. Join the Key Person Program. Members build important relationships with legislators who are influential with issues affecting CPAs, business, and the economy.